These days businesses must take into account a digital presence strategy to keep up with the times. A long time ago, in a land not so far away, there existed a simpler world, a world where printed newspapers reigned supreme and basic posters delivered marketing messages to attentive audiences. But that world is no more. In its place, we now face a cluttered media landscape where distracted audiences are inundated with ads. Endless online content competes for a share of impressions and those who know how to navigate the complexities of digital marketing will prevail. Others will struggle to survive. OK, so maybe we’re being a tiny bit dramatic. 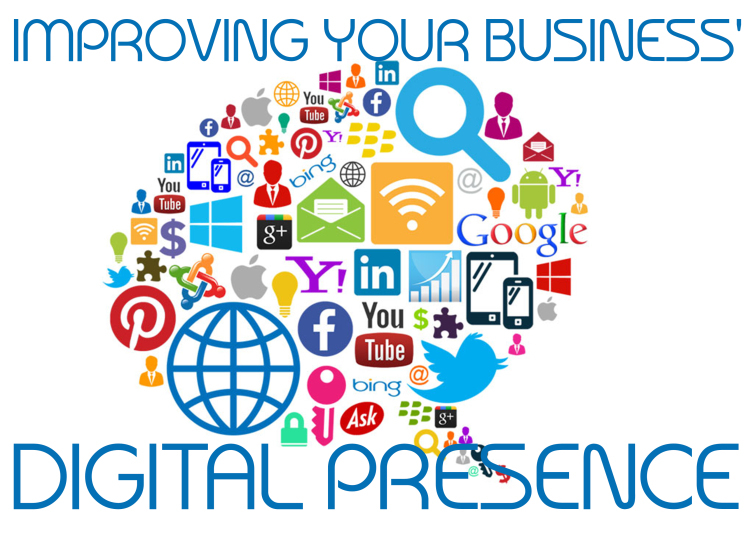 But it is true that in our modern world, your digital presence says a lot about your brand. Today’s audiences expect to be able to interact with brands online. Even organizations that have traditionally catered to less tech-savvy demographics are discovering the importance of incorporating at least some digital marketing into their approach. Think its time for a digital strategy update? Here are a few tips to help you get the best return on investment (ROI). Not every digital platform is right for every audience. And if most of your audience only uses Facebook, there’s no need to waste your time on Pinterest and Snapchat. Take the time to learn your audiences’ preferences and demographics, and focus your efforts on their digital outlets of choice. Most of the time, you’ll need more than just a website to say you’ve got a successful digital footprint. Your digital efforts should work cohesively so each platform drives traffic to the others as you help your audiences move through the buying journey. For example, maybe you have a digital ad that directs people to your website, where they have the opportunity to sign up for your e-newsletter to receive updates, follow you on social media and/or contact you directly to learn more. Similarly, your e-newsletter and social media pages can direct people to landing pages on your website where they can make purchases, claim promotional offers, etc. You might have the most beautiful website in the world, but if visitors can’t figure out how to navigate it, they’ll jump ship pretty quickly. Across all of your digital platforms, it’s important to keep in mind how your audience thinks. Make the information they’re looking for easy to find. For example, keep your wording simple and concise, create clear calls to action, and work to ensure emails and webpages load as efficiently as possible. Your digital presence should be structured to provide an excellent customer experience. Reinforcing your message through multiple digital touch points is important — but how do you know how much is too much? Where’s the line between creating an action-inspiring email campaign and coming across as spammy? This will largely depend on your audience, as well as the quality of your content. Don’t create social media posts, write blogs or send emails just for the sake of saying you did it. Make sure you actually have something of value to share with your audience. And, as you launch campaigns, evaluate your audiences’ reactions. If you try sending out two e-blasts in a week and find you get less opens or more opt-outs, it may be a sign that a lower frequency would be better. One of the great things about digital marketing is that it’s much easier to scale your campaigns and analyze the success of your efforts than it is with more traditional media. This gives you the freedom to test your ideas with less risk. For example, you can try out to different versions of ad creative, assigning a relatively small budget to each, and then do a larger campaign with whichever version proves most effective at accomplishing your goals. Tracking your campaign results goes hand in hand with every other tip on this list. Digital platforms give you access to a wide variety of metrics that you can monitor to determine how well your efforts are working. As you experiment with different frequencies, platforms, calls to action and creative elements, keep a close eye on which efforts have the biggest impact in moving you toward reaching your campaign goals. There’s another important component to take into consideration when maximizing your digital presence. Take time to ensure that your online profiles have updated, accurate information. These platforms, like Yelp, Google My Business, Trip Advisor and more are additional touch points potential customers may come across when researching your business. In fact, for some, this may be their first interaction with your company, shaping their first impression. Monitoring these platforms continuously as part of your marketing strategy will help you control your company’s narrative online. You’ve figured out a successful approach, so now you get to head to the beach, relax and congratulate yourself, right? Well, sure, but don’t forget the work is never quite over. The digital landscape is constantly changing. Over time, new platforms replace old favorites and audiences’ preferences shift, so it’s important to always stay informed. That way, you’ll be able to modify your strategy to take advantage of new opportunities and reallocate efforts that are no longer beneficial. Figuring out the best approach to maximizing your organization’s digital presence takes patience and a willingness to continuously experiment, evaluate and modify. But those who put in the effort stand to reap significant rewards. Ready to get started on that digital marketing strategy update? We’re here to lend a hand.